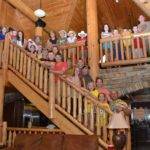 Pigeon Forge, Tennessee is one of the most popular family reunion destinations in the country! Located just a day’s drive from 60% of the nation’s population, the Smokies are a convenient meeting place if your relatives live all across America. To help you plan your Pigeon Forge family reunion, Moose Hollow Lodge has put together the following four steps for organizing your getaway. The first step to planning your family reunion is deciding who you want to invite. When you stay at Moose Hollow Lodge, you can feel free to reach out to all of your aunts, uncles, and cousins, because this cabin can accommodate up to 56 guests! With three levels and nine large bedrooms, Moose Hollow Lodge is one of the biggest vacation rentals in Pigeon Forge. Once you have come up with a tentative guest list, start tracking down everyone’s phone numbers and email addresses so you can get in touch with them. While you have your relatives on the phone, be sure to ask them which attractions, restaurants, and activities in Pigeon Forge they are most interested in. When you have your guest list and dates finalized, go ahead and book Moose Hollow Lodge. Our cabin is in high demand, so the earlier you can make your reservation, the better. To see when Moose Hollow Lodge is available in the coming months, visit our Reserve Now page. Moose Hollow Lodge comes with an awesome theater room, so you will definitely want to plan a movie night during your family reunion. Ask your relatives what films they are interested in watching so you can bring the DVD or Blu Ray with you to the cabin. Featuring 22 cinema style seats with rumble technology, a 13’ x 6’ viewing screen, and surround sound, the theater room at Moose Hollow Lodge is better than an actual movie theater! 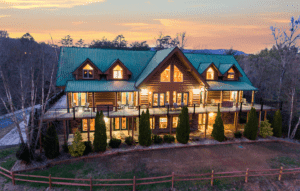 To learn more about everything our Pigeon Forge family reunion cabin has to offer, take a virtual tour of Moose Hollow Lodge. If you have any questions about amenities or the cabin’s location, don’t hesitate to give our friendly vacation specialists a call today! Fabulous stay! This lodge has it all! You won’t get bored…we used the chapel for Karaoke, the pool house was day time and night time fun! The game room was always occupied for there is something for everyone in it. The theater with the rumble seats was my favorite room! Also the games and puzzles located in the loft was a nice quiet place to hang out. This was a perfect place to take all my family and friends. Literally down the road to horse riding stables and also great location to easily get into Pigeon Forge for shopping / eating / entertainment, etc.